Scotland is simply superb for mountain biking and cycling with world-class trails, stunning scenery and great places to explore. Combine this top destination with a Motorhome or Campervan short break or holiday and you have the makings of a truly wonderful adventurous time. There is a surprisingly varied range of opportunities, offering something for everyone, from extreme mountain biking to easy cycling routes that the whole family can enjoy. An ever-growing network of fun and challenging mountain biking trails for all skill levels is available, from the fantastic 7stanes of southern Scotland at places like the globally-renowned Glentress, to new trail centres in the Scottish Highlands. If you want to try mountain biking in the wider landscape, there are numerous wild and remote trails all over Scotland which are easily accessible. Or you can take to the countryside paths which take you through charming towns and villages. The Scottish National Cycle Network offers myriad routes across and around the country, from day tours to long-distance, coast-to-coast epics. Cyclists are catered for even in Edinburgh, with its network of cycling routes enabling you to see a surprising side of the Scottish capital. Use your motorhome or campervan to “bag” a different trail every day. Scotland is relatively small and offers the mountain biker and cyclist a massive range of different trails and routes. Instead of basing yourself at one location, why not make your base mobile and use it to explore even further. Atlas have a range of motorhomes and campervans that are specially kitted out for bikers and cyclists. In addition to bike racks you can also choose to have an indoor “garage” to keep your pride and joy dry and secure. You may also wish to pressure wash your trusted steed after a dirty, gritty & muddy day out. Keep it in tip top condition for the next day’s adventure. There are other options, including spares and cleaning kits all available and can be selected at time of booking. 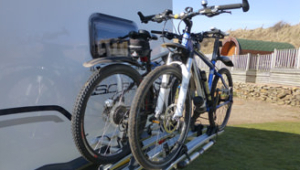 After a day’s riding return to your motorhome or campervan, pop open a drink from the fridge, have yourself a hot shower and settle down to a BBQ and social in the great outdoors. If weather permits, you may wish to relax inside with the heating on and the latest MTB skills DVD playing on the flat screen. You may want to log on and share your photos and experiences of the day with your Facebook friends or your Twitter fraternity. Once you have successfully made them all jealous you can settle for the night, go to sleep in the comfortable bed and dream of more trails, roads, mountains, rivers, glens and peace and quiet. However you choose to use your vehicle it will be a time to savour and an adventure to beat all others….’til the next time of course. So what are you waiting for? Get on your bike and get out there! Enquire now! We have a large range of bikes for hire. We can cater for children and adults and provide a range of mountain bikes, hybrid bikes and road bikes. Please select the bikes you wish from our options when booking. Scotland is a fantastic place to see from the saddle. So, whether you are a seasoned cyclist or just happy to potter about at a gentle pace to go to the shops, then please be sure you rent a bike.